You are the most important person in our world. We know that without you, there would be no chairsIn.space. We have tried hard to make the following application usage terms less fine print and more of a help full guide. On behalf of the entire chairsIn.space group, welcome. chairsIn.space gives notice that the particulars/information relating to any Meeting Space (meeting room, training room, day office, co-sharing work-space & video conferencing room, of varying layout types) on the website are provided by the vendors (and displayed on their behalf) and are intended as a general outline for guidance only and, except where specified, do not form, or form any part of, any offer or contract with chairsIn.space. chairsIn.space is not responsible for the validity of the details relating to the Meeting Space shown. Users should not rely on them as statements or representations of facts but as best endeavors of chairsIn.space to obtain and supply this data. chairsIn.space and its employees do not have any authority to make or give representations or warranties in relation to the Meeting Space. While we are not liable for any dispute you have with the venue as stated in our limitation of liability, we want you to have a positive booking experience. 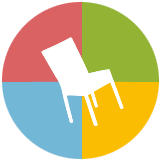 If for any reason you are not satisfied with any part of your booking experience, you agree to inform us immediately by emailing support@chairsin.space. We will use reasonable endeavors to resolve any issue you may have. Any refunds we make to you will be in the booking currency in which you made payment. When you book a meeting space via the chairsIn.space application, you will be entering a contract with company who’s website you are booking with (Contract). chairsIn.space shall not be liable for any delays or losses caused for any reason. chairsIn.space, its employees, agents and sub-contractors shall not be liable for any loss, damage or theft of personal property belonging to any customer or attendee, whatsoever and howsoever occurring at the venues. IN NO EVENT (I) WILL CHAIRSIN.SPACE OR ITS SUPPLIERS, OR THEIR DIRECTORS, EMPLOYEES, AGENTS, AFFILIATES OR SUPPLIERS, BE LIABLE TO YOU OR ANY THIRD PERSON, OR (II) WILL VENUE OWNERS OR THEIR DIRECTORS, EMPLOYEES, AGENTS, AFFILIATES OR SUPPLIERS BE LIABLE TO MEMBERS, IN EACH CASE FOR ANY INDIRECT, CONSEQUENTIAL, EXEMPLARY, INCIDENTAL, SPECIAL OR PUNITIVE DAMAGES, INCLUDING FOR ANY LOST PROFITS, LOST DATA, PERSONAL INJURY OR PROPERTY DAMAGE, OF ANY NATURE WHATSOEVER, ARISING FROM YOUR USE OF THE SERVICE, ANY CONTENT OR OTHER MATERIALS ON, ACCESSED THROUGH OR DOWNLOADED FROM THE SERVICE, OR A MEMBER’S USE OF A VENUE, EVEN IF CHAIRSIN.SPACE (OR THE VENUE OWNER AS APPLICABLE) IS AWARE OR HAS BEEN ADVISED OF THE POSSIBILITY OF SUCH DAMAGES. NOTWITHSTANDING ANYTHING TO THE CONTRARY CONTAINED HEREIN, AND TO THE MAXIMUM EXTENT PERMITTED BY APPLICABLE LAW, (A) CHAIRSIN.SPACE LIABILITY TO YOU OR ANY PARTY CLAIMING THROUGH YOU, AND (B) EACH VENUE OWNER’S LIABILITY TO A MEMBER OR ANY PARTY CLAIMING THROUGH SUCH MEMBER, IN EACH CASE FOR ANY CAUSE WHATSOEVER, AND REGARDLESS OF THE FORM OF THE ACTION, IS LIMITED TO THE AMOUNT PAID, IF ANY, BY YOU TO CHAIRSIN.SPACE FOR THE SERVICE, OR, WITH RESPECT TO VENUE OWNERS, THE AMOUNT PAID FOR THE APPLICABLE VENUE, IN THE 12 MONTHS PRIOR TO THE INITIAL ACTION GIVING RISE TO LIABILITY. THIS IS AN AGGREGATE LIMIT. THE EXISTENCE OF MORE THAN ONE CLAIM HEREUNDER WILL NOT INCREASE THIS LIMIT. VENUE OWNERS ARE EXPRESS THIRD PARTY BENEFICIARIES OF THE PROVISIONS OF THIS SECTION THAT ARE APPLICABLE TO VENUE OWNERS. chairsIn.space may modify the Service, and all content, software and other items used or contained in the Service, at any time. References on the Service to any companies, organizations, products, or services, or other information do not constitute or imply endorsement, sponsorship or recommendation thereof, or any affiliation therewith, by chairsIn.space. You may terminate your chairsIn.space account at any time by providing chairsIn.space with notice of termination in accordance with the instructions available through the Service. Your access to, use of, or participation in the Service, including any content therein, may be prevented by chairsIn.space at any time after your termination of your account. Notwithstanding anything herein to the contrary, upon termination of your account, chairsIn.space will remove your Profile and cease displaying your Profile Content, including your Venue listings if you are a Venue Owner, on or through the Service. Use of the Service by Venue Owners is also governed by our Venue Owner Terms located at http://chairsin.space/venue-owner-terms. By using the Service as a Venue Owner, you are consenting to the terms of the Venue Owner Policy. You may be able to display certain information on designated portions of the Site or otherwise through the Service regarding you or your company or organization including company and venue information, (collectively the “Profile Content”). You agree to provide accurate and current information in your Profile and to promptly update the Profile Content to keep it accurate and current. chairsIn.space does not verify the accuracy, completeness, reliability or authenticity of any User Content, including any Venue descriptions or Venue availability information provided by Venue Owners, and makes no representations or warranties with respect to any User Content. -upload, post, transmit, distribute, store or otherwise make available content that, in the sole judgment of chairsIn.space, is objectionable or which restricts or inhibits any other person from using the Site, or which may expose chairsIn.space or its users to any harm or liability of any type. The Site may contain (or you may be sent through the Service) links to other web sites (“Third Party Sites”) as well as articles, photographs, text, graphics, pictures, designs, sound, video, information, and other content or items belonging to or originating from third parties (the “Third Party Content”). Such Third Party Sites and Third Party Content are not investigated, monitored or checked for accuracy, appropriateness, or completeness by us, and we are not responsible for any Third Party Sites accessed through the Site or any Third Party Content posted on, available through the Site, including the content, accuracy, offensiveness, opinions, reliability, privacy practices or other policies of or contained in the Third Party Sites or the Third Party Content. Inclusion of, linking to or permitting the use of any Third Party Site or any Third Party Content does not imply approval or endorsement thereof by chairsIn.space. If you decide to leave the Site and access the Third Party Sites or to access or use any Third Party Content, you do so at your own risk and you should be aware that our terms and policies no longer govern. You should review the applicable terms and policies, including privacy and data gathering practices, of any site to which you navigate from the Site or relating to any applications you use or install from the site.